Members of the community at Christmas party at Restore Orlando waiting for Santa Clause to arrive. The annual party featured Christmas trees, decorations and a bounce house. Members of the Orlando Magic, K-Mart, and other boosters often donated gifts, such as bicycles and bags of toys. Presents were unwrapped, so parents could be involved in the acquisition and wrapping of the gifts. Santa would arrive in a helicopter, truck bed, or some other vehicle in order to elicit an excited response from the kids. Original 5 x 7 inch color photograph, December 1997: Private Collection of Dedra Jenkins. Digital reproduction of original 5 x 7 inch color photograph, December 1997. 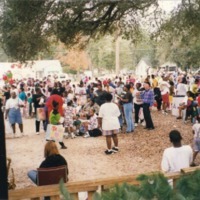 “Restore Orlando Christmas Party, 1997.” RICHES of Central Florida accessed April 18, 2019, https://richesmi.cah.ucf.edu/omeka/items/show/7782.